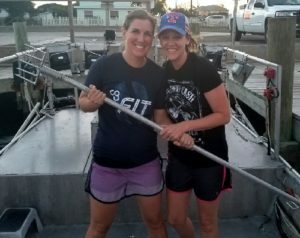 The Right Guide | FLOUNDER GIGGING! ROCKPORT, PORT ARANSAS, CORPUS CHRISTI, TX! Every year thousands book fishing trips with more than 3000 guides down here in the Texas Coastal Bend. Just like restaurants, some are great and others you wonder how in the world are they still in business. So here are a few things to ask and checkout to make sure you don’t get stuck with Captain Lame. It is very common and popular for fishing guides to post recent catches so that everyone can see how well his trips are going. If the guide doesn’t have a “facebook” page, this should be a quick red flag that says “Stay Away!” Most of these guides exaggerate they’ve been fishing a long time and know where the flounder are, but they only come back with a fish or two for their customers. 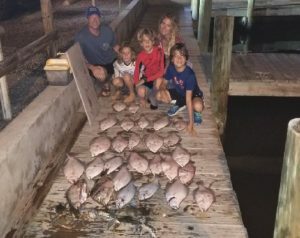 That kind of work ethic results in photos that show few fish caught so as they say, “The Proof is in the Pudding.” Note: Flounder limit per trip is 5 flounder per person! Got to laugh at these pay check captains I often seen some guides back at the docks no matter what in 4 hours 1 fish or 20 fish and very seldom is it ever the 20 fish. 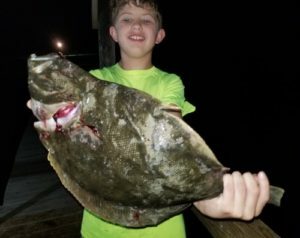 A good flounder guide will stick it out until you have your limit of flounder or request to come in. How many people can flounder gig at one time? Some boats only 1 person gets to gig at a time, while other boats will allow up to 4 people gigging at the same time. Some captains don’t allow smoking, alcohol or kids – know before you go. Some captains will gig your fish then hand the gig to the customer – which eliminates the thrill of doing it yourself. Be assured that nothing is worse than paying for a trip with a captain that will only let you watch him do all the gigging or allowing just one person at a time to fish (while the other people on the boat just sit there). A professional fishing guide will clean and bag your fish for the trip home – but occasionally there are some who leave the cleaning up to you. These types of guides give a bad reputation to our industry – so please be aware that not all guides are honest, ethical or care. Sad to say, but true and honest. Avoid the “Jack of All Trades” guides, seriously. If you’re fishing offshore, then pick a qualified and professional offshore guide. 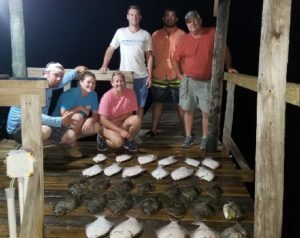 If you want to go bay fishing, there are many qualified and licensed guides for these trips that include flounder guides like Capt. James. Fish in general area always moving, hiding-out in sand pockets and they come and go switching locations throughout the day and night. Let’s face it – it’s just flat-out impossible for any professional fishing or flounder guide to be out all day long fishing the hotspots for reds and trout and then take a trip at night expecting to know where the flounder are at that time. You could end up moving in the boat 6 to 7 times while the guide is trying to find the flounder. The Point? Stick with a professional who knows their stuff! 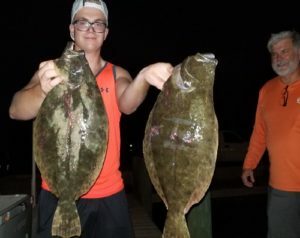 If you’re going flounder gigging, choose a professional flounder guide specialist and you’ll be very happy you did! Note: It takes a certain type of fishing captain to teach and keep the kiddos entertained on an evening trip. Only the best can provide your family and/or friends with a fun time on the water while teaching the basics and putting guests on the fish – every time! So go with the best! 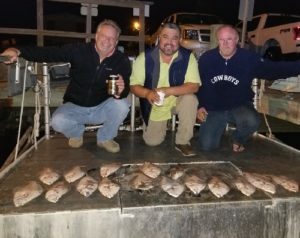 Nocturnal Assault Flounder Gigging Captain – James Parbst is your best bet and of course “Safety is Priority One”! The Captain asks that you drink responsible – beer and alcohol are ok – just keep in mind that you’re in a boat on the water and save the real celebrating for when we get back to the dock with all those fish! Steer clear of guides that bring you back before getting you bring-in your limit of fish. 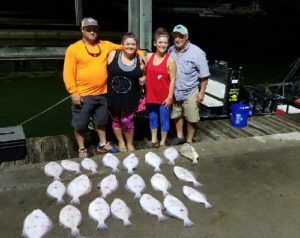 They are clock-watchers and are basing your trip more on the time spent trying to find flounder versus how many flounder were actually caught or gigged. You’ll have to really hold them to their word and no one want to have to do that. With Capt. James, he doesn’t come in to the dock – without meeting the limit – unless you ask him to. Sometimes, limits are caught quickly while other nights (those nights when the flounder didn’t get the memo that Capt. James was coming with some special guests), some evenings might take a little longer to get your limit! All in all, you’re going to want to tell your friends at work, relatives and other family members about your trip with Capt. 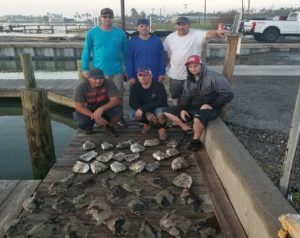 James Parbst – one of the Texas Coastal Bend’s Finest Flounder Gigging Specialists! Capt. James wants you to have the most memorable trip possible, works hard for the fish and his customers and makes sure that all have a great time with him!